WDW and Universal Studios Planning Tips - for someone without a car! I don't know about you, but I do a lot of planning with my holidays. I borrow heaps of guide books from the library, purchase travel guide ebooks from Amazon, ask alot of questions on Tripadvisor.com, consult with other Disney fans and search endlessly on the internet on best ways of doing things. In the end, I write everything into one small Notebook, which I take to the parks (and everywhere else). The Notebook was the beginning of this entire website. I found every tip I received, was not replicated in every guidebook! And some were only found on Tripadvisor.com. So my Notebook became a great summary from multiple sources. And yes, I do take the Notebook to all the Parks- it is lighter then carrying the original guidebooks! On our first trip to Disneyland in 2015, I didn't know what to expect with the rides, so yes, every ride was written about, such as what to expect, rated a score, notes on how scary it might be and why (for my daughter) and some interesting trivia about the ride. This helped also pass the time in line! My notebook also included where to eat (and not eat!) and other tips (mainly about Downtown Disneyland). I am currently writing another Notebook for WDW. And I thought it might be nice to share it with you all online - the tips that I have found at the planning stage. Its a work in progress, feel free to share in comments if you think something is wrong or want to add something. The tips are untested at this stage - but I will let you know how they go in practice during 2018. Accommodation - On Site Disney or Off site? We have booked an All Star Disney hotel. Its 3 stars (budget), but includes a pool (part of our holiday criteria generally). 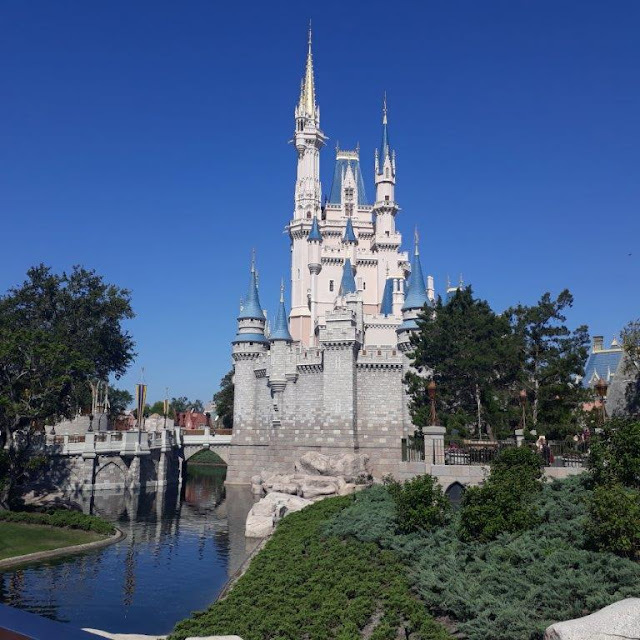 After much researching to stay on a Disney property versus a Off-site Disney property, I came to the conclusion that the advantages vastly outweighed the disadvantages. Namely, we wouldn't have a car in Orlando. And the All Star Disney Hotels have regular shuttle buses to and from the parks, before, during and after Park closing. This is not the case with the Off-site Hotels which generally have 2 transfers to the park, and 1 transfer back, not always at good times. It was important for us to have this bus transfer flexibility with times. Also, there is free transport to and from Orlando International Airport too with the Disney hotels, which is not the case for Off Site hotels- so some money saved there automatically. What sealed the deal was that to do day trips to say the Kennedy Space Station (by bus), the 'All Star Hotels' were a pick up location for the day trip! Anyways, for better or worse, this is where we have booked! Staying on Site also has the advantage we can book FP (Fast Pass) tickets 60 days in advance! Both Universal Studios parks are on our itinerary, but one curious thing I have found with my research is that there seems to be no transport options to Universal Studios by public transport that is reasonable. I have read that Disney really do not advertise the fact that Universal exists and vice versa. I have also read that Universal prints maps of Orlando - without Disney on the map! Hmm. There is an I Ride Trolley option, but this seems to include a 15 minute walk at the Universal Studios end (through unfamiliar territory, and at the end of a long day might not be viable). Anyways, I have discovered that most people use UBER! We have decided not to do Park Hoppers for WDW. We did this for Disneyland Anaheim, where California Adventure Park was just across the 'mall' and was easy to do. But have read a bit about this for WDW, and I don't think we will do this due to the hassle of getting transport wise, from 1 park to the next to make it worthwhile. I did think originally we could park hop from say Animal Kingdom (AK) to Epcot (with a later opening time). However, with the introduction of Pandora in AK, the AK park now has longer hours usually, and the Park Hopper is probably not needed. However, I have read that you can get a Park Hopper at any time before the expiry of your Disney tickets, so we can decide when we are there if we require it or not. Other clever things I have found out about Park Hopper tickets, you can get Fast Passes (FP) for your second park visit in the day. So do standby rides in Park 1 and then could jump from Park 1 to the 2nd park, and have your FP ready for the second park. I think this method is a bit risky - what if you are enjoying the first park and don't wish to leave it just yet and also you will miss out on getting any FP in this first park. This strategy is probably better for a return visitor. We have decided to get a Park Hopper for Universal Studios, so we can get on the Hogwarts Express (Diagon Alley to Hogsmeade) train. You cannot do this ride without the Park Hoppers. As this ride is unique in all Universal Studios, this seems like a must do. To meet Mickey Mouse - head for the Towns Square Theatre on Main Street near the Train Station. He greets guests there all day. Fast Pass available. MK is actually on the 2nd floor of the park. The first floor is filled with tunnels known as 'Utilidors'. In these Utilidors, deliveries are made, cast members access attractions and garbage is taken away. Walking is the fastest means of transport in MK. Disney World Railroad - lines are shortest at Main Street. "Kiss Goodnight" Cinderella's Castle flashes with a dazzling rainbow of light. Not on the schedule, about 30 mins after posted closing time. A recording of Roy Disney (Walt's brother) thanks everyone for coming. Night Electrical Parade - best views from Frontierland near Country Bears. If parade is on twice per night - go to the second parade. Also best view 2nd floor of railway station. Ariel's Grotto - go before 10:30am or last 2 hours park is open. Queue is not air conditioned. The meet and greet for Ariel at the entrance causes delays for this ride. Duration 30-90 second ride, probable waiting time 45 minutes. Peter Pan - Use FP. A new themed queue from 2015. Air conditioned, walk through the Darling street home where you see family portraits, various rooms, a few games and get sprayed with pixie dust in queue! Winnie the Pooh - As this ride overtook Mr Toads Wild Ride, there's a painting inside the ride that shows Mr Toad Passing along a deed to Owl. Astro Orbitor - 1.5 minutes. Best at night. Flies higher and faster then Dumbo. Tomorrowland Indy Speedway - 4.5 mins long. Don't rush through the speedway. Better to drive slowly then sit for 5 minutes in pit waiting to be unloaded. Seven Dwarfs Mine Train - Use FP. A rollercoaster that goes for 2 minutes. Loads fast. There are no loops, inversions, rolls in track, no massive hills or steep drops - rather the trains vehicle seats swing side to side as go through the turns. Disney has designed a curvy track with steep turns. Elaborate indoor and outdoor section. Swinging more noticeable near the back of the train. Magic Carpets of Aladdin - Loads slowly. FP almost never needed. Ride before 11am or after 7pm. 1.5 minutes duration. Flying carpet ride with spitting camels that guard the ride. Try to avoid the water. The front seat controls vehicle height, the back seat the tilt. Enchanted Tiki Room - Roof looks like straw, but it is actually shredded aluminum! The tiki statues located across the walkway do squirt water at guests. Pirates of the Caribbean - Queue in the dungeon. Scariest parts are in the first 3 minutes - skeletons, cannons, darkness mist. The skin of the human audio-animatronics is made of rubber. Every few years the skin must be replaced because it cracks. Begins with a 14 foot drop over a waterfall. You'll see 65 pirates, 19 cannons and 60 animals. Captain Jack Sparrow appears 3 times. Jack Sparrow's Pirate Tutorial (in Adventureland) - Volunteers from Audience learn how to be a pirate. Check out Entertainment schedule. Duration 20 minutes. Standing room only. Outdoors, First and last shows least popular. Splash Mountain - Get wet if in the front, sitting on the right. Tom Sawyer Island - closes at Dusk. Haunted Mansion - Go before 11am or last 2 hours the park is open. Tombstones outside feature the names of the Imagineers who designed the ride. Keep watching Madame Leota's face and you may be surprised. And be sure to take a glance at the pet cemetery when you leave. Liberty Square Riverboat - 15 minute cruise. Hall of Presidents - So lifelike its apparently eerie. Barnstormer - a Rollercoaster. Not as tame as you think. The cars are too small for most adults and can cause whiplash for tall people. Best choice for food - Cosmic Rays Starlight Cafe in Tomorrowland (burgers, sandwiches). Lines move fast. More planning tips in future blog posts, including Epcot, Animal Kingdom and Hollywood Studios!